Vudu, a Silicon Valley company with big ambitions, is positioning its new set-top movie box as the ultimate in convenience. 5000 movies. 25 studios and distributors providing content. A 5-button remote. 1 couch. 0 waiting. With Vudu, I no longer have to drive to the local Blockbuster, only to find that the movie I want to watch is not in stock. I don’t have to wait for the mailman to deliver my next film from Netflix. I don’t have to rummage through lean video-on-demand and pay-per-view offerings, only to find there’s nothing worth watching. Which is why the thought of watching nearly any movie, when I want to watch it, is so intoxicating. Maybe, I thought, the Vudu set-top box and movie service would be so compelling that I could get rid of Netflix and Blockbuster memberships. I had to try it. After using Vudu for just over a week, this is what I discovered. Vudu’s set-top box costs $400 and is now available at Vudu and will be sold eventually through Amazon. It’s a handsome 4-pound box, about 7 by 9 inches, that connects to your TV and the Internet — not unlike the AppleTV. Its 250 GB hard drive provides ample space to hold 100 full-length movies. But before you purchase Vudu, there are two requirements that must be met. First, test the speed of the Internet connection Vudu will use. For optimal performance, Vudu recommends a connection of 2 Mbps for instant playback. 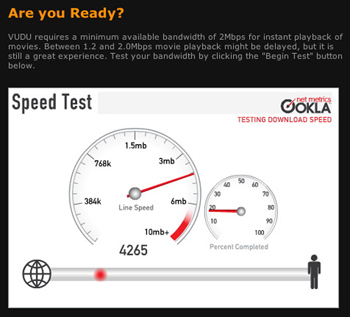 If the connection is between 1.2 and 2 Mbps your playback may be delayed; once the movie starts, however, you should not experience interruption. Vudu does not recommend a connection less than 1.2 Mbps. Second, know your environment and how you’re going to connect Vudu to the Internet. What ticked me off is you need an Ethernet connection near your television. I live in an older home. I do not have an Ethernet connection next to my TV, nor do I want to install one. My AppleTV uses a wireless connection. Problem solved. To test Vudu, I had to buy a $45 50-foot Ethernet cable. I ran the cable from an Apple Extreme wireless router, located upstairs in a makeshift office, to the Vudu box downstairs in the family room. To get this to work, I had to push the Ethernet cable out a second-floor window, let it fall to the ground, and then thread it through a window near the TV so I could connect Vudu to the Internet. Not a pretty installation. Vudu says I can plug the box into any number of Ethernet or game adapters (using 802.11g), but I didn’t have one on hand. Vudu doesn’t recommend any adapters in setup documentation, either, so people unfamiliar with using one will be lost and possibly frustrated. Vudu’s setup is as easy as hooking up an AppleTV, and that’s saying something because few manufacturers come close to Apple for ease-of-setup. I plugged the batteries into the Vudu remote. I attached a small antenna to the back of the set-top box. The remote uses RF and not infrared, so I don’t need line-of-sight to control Vudu. Very nice. I used an HDMI connection from Vudu to a Samsung plasma TV. If all your HDMI connections are used, Vudu accommodates component, S-video, and composite connections, with the varying degrees of quality associated with each. I used a digital optical connection for audio, and there were options for digital coax and RCA. I connected the Ethernet cable to the back of Vudu and fired up the box. Red light. Green light. Nothing. Be patient. After a brief delay, Vudu’s logo appeared on the TV display with the first of four setup steps. These are to detect video and audio connections, to set up the remote, to check the Ethernet connection, and to provide an on-screen tutorial. Super simple, and much appreciated. I have a pet peeve about remote controls. They’re horribly designed, with too many buttons that are inconsistently organized, cramped, and hard to see without a magnifying glass. Vudu’s remote, however, is functional art that’s a joy to use. It’s a small pod that’s sculpted to fit comfortably into either your left or right hand. It uses a scroll wheel and only five buttons — On/Off, Power, Back, Play/Pause, Vudu (home), and More (not in use yet). Fast forwarding and rewinding are accomplished through the scroll wheel. Best of all, you don’t even have to look at the remote to use it. When using the super-simple Vudu interface, I felt like I was standing in a virtual Blockbuster, browsing through endless movies looking for something to watch. All from my couch. 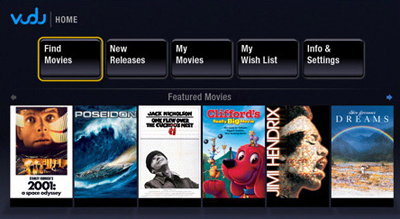 The Vudu home screen is split into five parts — Find Movies, New Releases, My Movies, My Wish List, and Info & Settings. Below the menu choices are highlighted movies, displayed graphically as if you were holding the DVD cover in your hand. Use the scroll wheel to browse through the highlighted movies and new releases. When I found something I was interested in, but didn’t want to rent or buy at the time, I added it to My Wish List as a reminder. If I found a movie I wanted to watch, I clicked on purchase or rent, the transaction authorized, and the download began. All rentals and purchases are found in My Movies. If I could not find a title I was interested in through browsing, I used Find Movies to sift through 18 genres. An on-screen alphabet –like the one used by the AppleTV — allowed me to search directly for specific movies, directors, and actors. Using a filtering feature I could sort movies by release date, MPAA ratings, critics’ ratings, studio, or availability to rent or own. Parental controls, used to keep kids from watching certain movie ratings or from renting or buying films, is located in Info & Settings. Vudu’s performance was flawless, considering movies are not stored on the hard drive. Rather, the first 30 seconds or so of a film is stored locally. Once ordered, the remainder of the movie downloads as you watch it using peer-to-peer technology. I realize I have a fast Internet connection — others with slower connections may experience this differently — but not once during playback did Vudu hiccup or cache. Vudu recommends that you leave the box powered on and connected to the Internet so it can download new movie titles when they’re available. The quality of the video was as good as any DVD I own. Vudu is capable of playing 1080p/24, 1080i, 720p, 480p, and 480i. It can play HD movies when the studios make high-definition content available. Surprisingly, I really like the new Vudu set-top movie box. Surprisingly, I really hate the new Vudu movie watching service for a number of reasons. The box itself is expensive at $400, but I thought I might be able to justify the cost to the wife if Vudu delivered the goods. Then I started doing the math. There’s no monthly subscription for Vudu like there is with Netflix or Blockbuster online. With Vudu you pay for what you consume, and that’s where it gets costly. Vudu’s rentals range from 99 cents to $3.99 for recent releases, which is on par with Unbox, but when compared with Netflix or Blockbuster Vudu is expensive. With its most basic plan ($4.99 a month), Netflix will send you two movies, one at a time. Two movies through Vudu is $8. One of Netflix’s popular plans is three movies rented at a time, as many as you’d like, for $17 a month. If you rent four movies or less a month, Vudu might work for you. But if you rent five or more, Netflix makes more sense. To purchase movies, Vudu is again on par with Unbox and Apple’s iTunes, which sells movies but does not (at least yet) rent them. Prices to own range from $5 to $20. When I first started playing around with Vudu, I thought most of the movies I wanted to see would be available. Sure, some films would not be available, but I could live with that. For the most part, there would be enough movies I wanted to watch to fill my appetite. I was wrong. Vudu’s selection is erratic and hard to figure out. Why are some movies available, and others are not? Rather than trying to figure out what movies are missing, I decided on a real-world test — my wife’s Netflix queue, which is filled with a variety of new releases, recent films (the past year or two), and a few oldies. These are the movies she and I want to watch. I wondered how many of them would be available through Vudu. If most, then Vudu was going to be a serious contender for our movie money, even with the $399 price tag to start. As it turned out, only two movies in my wife’s Netflix account (out of the top 10) were available on Vudu. And no TV shows.Needless to say, I was disappointed. Watching the first “Resident Evil” film, which I never saw, seemed like a waste of time when I really wanted to see “Unleased”, “Knocked Up,” “Thank You for Not Smoking,” “Little Miss Sunshine,” and others. Finally, I am not a fan of how long you get to watch a movie and how you are charged to do so. For example, I rented several movies to watch that, for one reason or another, I could not finish in one sitting. If you are not able to return to the film you’ve started within a 24-hour period, the movie disappears, forcing you to rent it again if you want to finish. This is not a problem with Netflix or Blockbuster. Also, you pay for your movies in advance rather than pay-as-you-go. 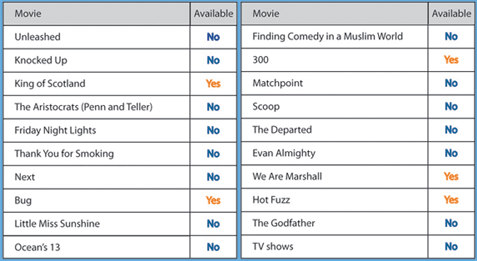 Vudu customers must choose a $20, $50, or $100 plan, from which rentals and purchases are deducted. When the account hits $0, the amount selected at setup is deducted again. VUDU has some really serious content issues – of the 5,000 advertised titles there’s little to rent. Their movie library if filled with titles one would find on a Hong Kong street corner or flea market. Laughable, amateurish, appalling movies that look like they’re been shot in someone’s basement. Much of the catalog is purchase only. New releases are not available to rent for 3-4 weeks, if ever. Quite a few older titles that have been staples at Blockbuster, or gathering dust at a the local supermarket, are purchase only. VUDU moderators are blocking forum posts critical of the product.